sherryede@hotmail.com and ask to be removed. We usually send around 4 newsletters a year, but our website is updated regularly. for our April 2013 production of CALENDAR GIRLS will take place on Sunday October 28th, 2.00pm, at The Rose Centre. There are wonderful parts for 10 women and 4 men in Calendar Girls. In addition to the six characters who play calendar girls, there are other members of the Women's Institute, a visiting speaker, the lady of the manor and a beautician. There are the wonderful roles for men particularly John who inspired the women to create a calendar and the who does the photo shoot. For more details of the cast please look at the Auditions section on the website. 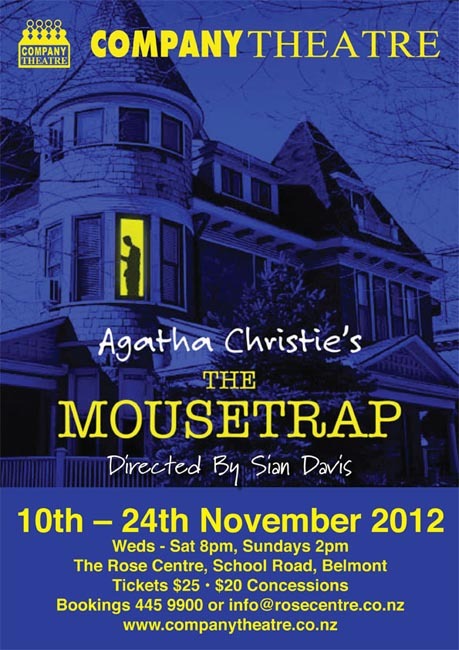 We are now looking for ushers and programme sellers for The Mousetrap season - November 10 - 24. If you would like to volunteer, you need to be a financial member, (but you can join on the night you volunteer, for $10). Financial membership has other advantage eg reduced prices for all our shows. See our Membership page on the Website. All our volunteers and helpers get to see the current production for no cost, on the night they volunteer. To register your interest in helping on Front of House, please email Ruth Chapman ASAP to ruthchapman@xtra.co.nz. Or you can phone Ruth on 489 8632. We look forward to welcoming you to our FOH rosters. It's a great way to meet other people and enjoy a show as well. Bookings are now open. Phone Richard at The Rose Centre on 445.9900, or see our webpage on BOOKINGS. Read more on the cast and crew of this show under the Current Productions page of our website.